Many professionals are intrigued by the idea of hosting their own networking event, and insurance professionals are no exception. “After all, there are clear professional benefits to becoming known as a connector, and if you’re an introvert, you can create events optimized for how you prefer to socialize,” wrote Dorie Clark, a marketing strategist and professional speaker who teaches at Duke University, in a recent blog. Over the past five years, Clark has hosted nearly 80 networking dinners and opined about various facets of the process. 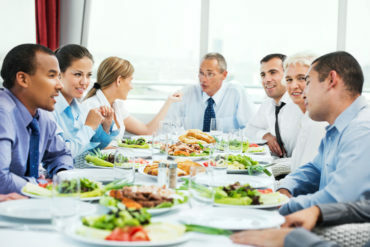 But often, it’s the little details that get in the way, she wrote in the blog How to Organize a Networking Dinner, posted on Harvard Business Review’s website last week. There are four key logistical points she advises to ensure the gathering is a success. The first is deciding where to hold the event. While those who are fantastic cooks may love the idea of inviting people to their home for a more intimate experience, the logistics can be difficult. For those set on hosting events at home, consider hiring a chef or at least recruiting servers to allow socialization time with guests. “And make sure you provide a variety of entrée options,” Clark advised, noting she now hosts all events at a restaurant, where they are used to accommodating dietary restrictions. (As well, try to hold events early in the work week, so the restaurant is less likely to be crowded and noisy). Next, determine how to handle payment. While it may be a chivalrous gesture for the host to pay for everyone’s meal, if you host frequent gatherings, it can get expensive fast, Clark notes. Alternately, it’s a logistical nightmare to break down each person’s order on a complicated cheque, and splitting the bill evenly risks being unfair to light eaters. The third logistical point revolves around sharing information about the guest list in advance. Clark says she sends out a reminder email to attendees about a week in advance, along with links to everyone’s website or LinkedIn profile. That enables them to connect afterward and — if they choose — research their dining companions in advance. If people prefer to be surprised at the gathering, they can simply ignore the links. Guests can state their name, where they live, some basic professional information and then “ask a bonus question that can uncover common interests among the guests.” For example, this could be anything from “tell us about a time you took an action you felt was brave” to “what is a charity you support and why? Funny how this article was published March 26, 2019 by Dorie Clark on the Harvard Business Review website.